This asus zenbook pro ux550ve laptop screen replacement LCD screen comes in more than one type, we'll need your help to identify the correct replacement part. You are viewing a Asus Zenbook Pro Ux550ve UHD Class I and fully compatible LCD screen part. We can supply this LCD with a MATTE (Anti-Glare) finish. Please check that your original screen has a glass area of 15.6" inches diagonally (not including the frame) and has a maximum resolution of 3840X2160 (or is known as UHD resolution ). This screen's backlight is powered by LED backlight technology. The signal connector on this LCD is 40 pin and is an eDP displayport, with a 0.5mm pitch, which can be found at the bottom right side of the screen - on the back of the LCD. This is a genuine IPS (AAS/ADS/AHVA or FFS/UWVA/PLS) screen offering ultra wide viewing angles. Asus Zenbook screens can sometimes come touch screen enabled, this product is a non-touchscreen model. We are supplying the raw LCD panel only without the front touch glass (digitizer). What information is required about my asus zenbook pro ux550ve? We need you to remove the laptop screen display panel from the lid of the asus zenbook pro ux550ve laptop. Once you have done this, you can supply the model number for your LCD screen using the easy and fast contact form below, and we will send you a quotation for the correct replacement. You should start by watching this short video tutorial, this shows you how to remove the LCD screen. The process takes around 15 minutes. Why is this information required to buy a asus zenbook pro ux550ve? Because there are variations of this particular screen for the model asus zenbook pro ux550ve, we need to verify details with you before you purchase. We take this measure with some models of screen that can be problematic to ensure you receive the correct product first time. 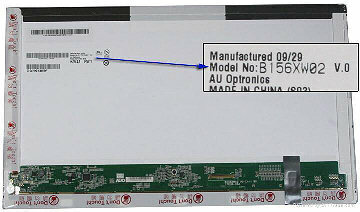 On the back of the actual display screen inside the lid of your asus zenbook pro ux550ve laptop, once this is removed from the lid, you will notice the model number printed on the back of the screen. Be careful to let us have any suffixes or revision numbers after the main part number as well. We�ve given some examples below to help you identify the model number on your particular screen. Once you have removed the old screen from the asus zenbook pro ux550ve laptop, you will be able to identify the screen model number. The model number is usually the boldest or largest text on the main sticker, as in the example below. No reviews yet for the ASUS ZENBOOK PRO UX550VE 15.6 UHD LAPTOP SCREEN NO DIGITIZER, why not be the first to leave one? Laptop-LCD-Screen.co.uk guarantee you a working Asus Zenbook Pro Ux550ve UHD screen replacement, or your money back. With our 13 years of trading experience, we can warrant that claim with real expertise. If you research our company, you will encounter our impressive accumulation of fantastic reviews on sites like Trustpilot and Google.